The holidays are all hustle and bustle, getting things decorated, baked and cleaned up for holiday guests. The kids have massive lists for Santa and those elves have to get hard at work wrapping everything just so. Behind all the Christmas business are a tired looking mom and dad. We can't have that when we have guests to host. 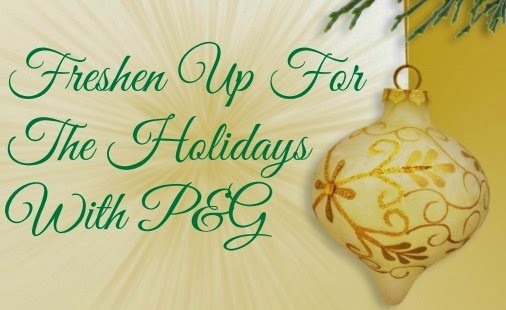 P&G has some great products for his and her to ensure mom and dad look and feel their best this holiday season. Men can be as bad as women when it comes to taking care of themselves in the washroom. Do you really blame them? They only want to look and smell their best for the ones they love, too. The new Old Spice Swagger line should have him smelling and feeling fresh in no time! Start off with in the shower with Old Spice Swagger body wash paired with Old Spice antiperspirant to give him an irresistible scent from head to toe. If the holiday celebrations run into the night and he needs to freshen up in a flash, try Old Spice Re-fresh body spray to quickly get that fresh feeling back and get on with the festivities! For his hair he can keep silky smooth, volumized and flake free with Head & Shoulders Advanced Thickening Tonic while Old Spice Spiffy Wax can keep his 'do in place all day! Clean up those Movember moustaches with Gillette Fusion ProGlide with Flexball technology power. Designed to respond to the contours of a man's face, this razor will have him feeling smooth and fresh under the mistletoe. A happy mom means a happy holiday season. It's time to pamper ourselves just a bit, moms. Mom will look her best with the new Herbal Essences The Sleeker the butter line which includes shampoo, conditioner and The Sleeker the butter smooth and creamy hair milk which all work to smooth hair and keep flyaways from happening all day long! If you are like me and enjoy styling your hair with blow dryers, curling irons or flat irons for special occassions, try Pantene Pro-V heat potion serum to add an extra layer of protection to your hair from damage up to 450 degrees to help keep it healthy looking. December can be such a draining month with so much to do and so little sleep happening. Keep dark circles under control with Olay Regenerist Luminus Dark Circle Correcting Hydraswirl and watch the appearance of bags and dark circles dissapear. However you celebrate the holiday season know that you (and him) can both pamper yourselves to look and feel your best for your festivities with help from P&G! For more information about P&G and the products mentioned please visit the PGEveryday website! Show some love and follow @PGEverydayCA on Twitter and like the P&G Everyday Facebook page! We want you to look and feel your best this holiday season. That's why our friends at P&G are offering up an amazing P&G His and Hers prize pack to one lucky AME reader! Open to Canadian residents 18+ excluding Quebec. Enter using the ballot below. Mandatory entry required. Ends December 29th, 2014. By entering this giveaway you understand your information will only be shared with representatives of P&G should your name be drawn winner. This giveaway is offered across various P&GMom/MamanP&G blogs. You may enter on as many as you like however you may only win this prize once. Posted on behalf of the P&GMom ambassadorship program. Perks and incentives are received for participation. Opinions and comments on this blog are those of the author. I always plan something fun for when my guests come over. A game, a contest, something that will get people relaxed and laughing. Plan ahead for things like do any guests have food allergies? Get the cleaning and cooking done in advance so you can spend time with your guests. Do as much cooking and baking as you can ahead of time. Make something that every guest like to eat. Have a potluck party where everyone brings an appetizer. That way you can enjoy your guests without stressing over food prep. My holiday entertaining tip is to go pot luck style. That way you will have a variety of food and won't be stuck spending all your time in the kitchen preparing food. I like to prepare appetizers and baked goods beforehand and freeze them. Saves me a lot of time and headache last minute! Go to someone else's place for parties & dinner. No mess, no stress!! P&G His and Her Grooming and Beauty Essentials Prize Pack. or have a potluck party where everyone brings an appetizer. Make sure you have clean hand towels and a scented candle - everything else is gravy. Host a potluck holiday party. This way you only have to serve a main dish and drinks which will give you the opportunity to spend more time with friends and family. Prep as much as possible in the days before your event. Prep and organization will get you through it! Plan ahead and prepare as much as you can ahead of time. My tip is to keep some appetizers and desserts in the freezer and some boxed chocolates on hand for unexpected visitors. Clean as you go so that you are not stuck with a big mess at the end. I make lists for everything so I don't forget anything. Buy some spare gifts in case someone unexpected drops in/or you are invited somewhere out of the blue! The best tip is to relax, and get the idea of "perfect" out of your head. Have fun. Enjoy your time with friends and family. Forgo a traditional floral centerpiece on the dining table and instead create a charming holiday scene featuring gingerbread houses or ceramic Christmas village miniatures. First sprinkle faux snow along the center of the table, then place homes, stores, trees and people to create a focal point that will delight guests of all ages. If guests are staying do as much as possible in advance, cleaning the most used areas last. Guests for a meal? Get everyone involved in the prep work for the actual meal (having prepared as much as possible before hand), I've found this nice since you can still converse with your guests. Do what's necessary. You don't need to go all out. always have frozen apps for when unexpected company comes. Keep dishes warm and ready in the oven for food that is ready to eat but for which the time hasn't come yet. Prepare as much as possible in advance before company comes. Get some seasonal towels and soaps for the bathroom. Have a poinsettia plant, fresh greens, or flowers in a vase in the room, a nice candle, and good music on to create a nice mood. bake in advance and freeze so you always have a backup in case you get surprise guests! My tip is to prep as much as you can before company shows up so you can relax and enjoy and mingle with your guests. I like to make sure that I have food and drinks for each person who comes. It makes it special for them. I also send kids to the basement and just have some light music playing. Plan ahead and go with the flow. Have a potluck party! The host can make a turkey and have all the guests bring something to contribute. Prepare as much as possible in advance. It's so much easier than trying to do everything the day guests are coming over. Don't leave preparations to the last minute. Do it potluck style, less stress for you! be organized and make a list of all the prep needed - from cleaning, to general household supplies, groceries, drinks, recipes, etc. And do a thorough house cleaning a few days before so that you can do a quick general clean on the day-of the event and be able to focus on the true prep work. and be a great, happy host! My best tip is allow extra time for last minute store runs, they happen to me every friggin time... it's always best to throw a few hours on to your baking/prepping time in case. Put something festive in the bathroom your guests will be using…like a mini Christmas tree and festive hand towels. We always make sure we have plenty of food on hand & we always have plenty of non-alcoholic & veggie options so no one feels excluded! My best tip is to relax. After all, it is only time spent with family and friends. If all else fails, open the wine and pour yourself the first glass.